Each FiveX machine system is a unique solution based on specific customer requirements. Built on the same platform but bespoke in width, length, height and set of features. When challenged we even redefine the machine specification to find the best machine solution for the task given. Product development driven by customers’ demands and market needs. 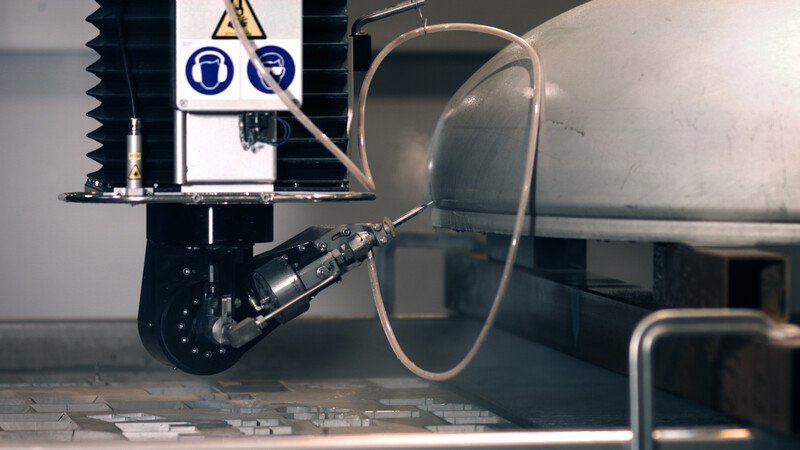 High precision abrasive water jet cutting has been an area of expertise for decades. 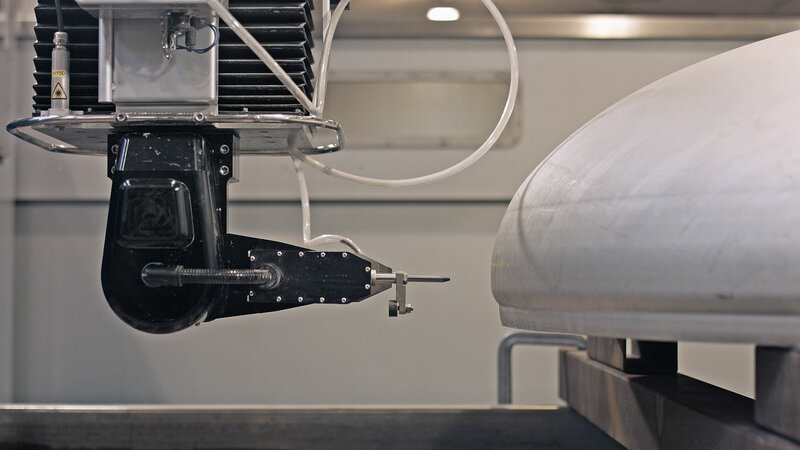 Since the international breakthrough in 1999, winning the prestigious order from Daimler Chrysler Aerospace, Water Jet Sweden has been serving high tech industries, like aerospace, defense, chemical and power corporations, all over the world. 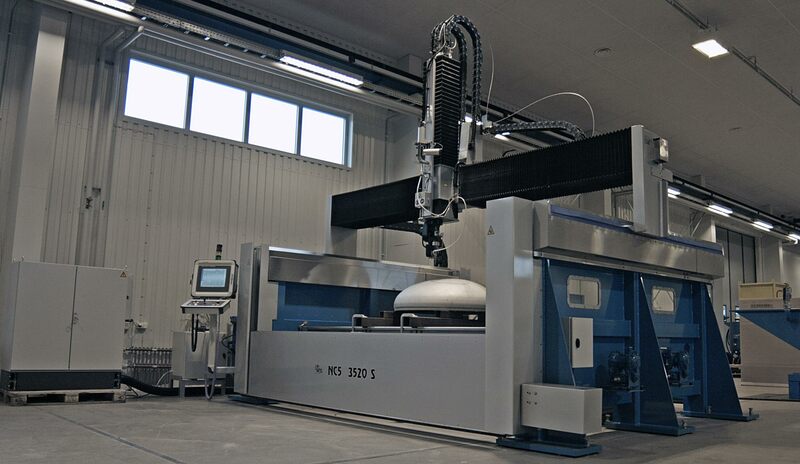 Water Jet Sweden has one of the broadest waterjet product portfolios in the world. The FiveX Machine System is the top of the line machine model in the portfolio. With a Z-movement of 750-1500 mm and a ± 0-91° cutting angle it is specifically designed to manage high precision 3D abrasive cutting in space. When building a FiveX machine, made for cutting in space, you need to look extra carefully at the safety aspects. 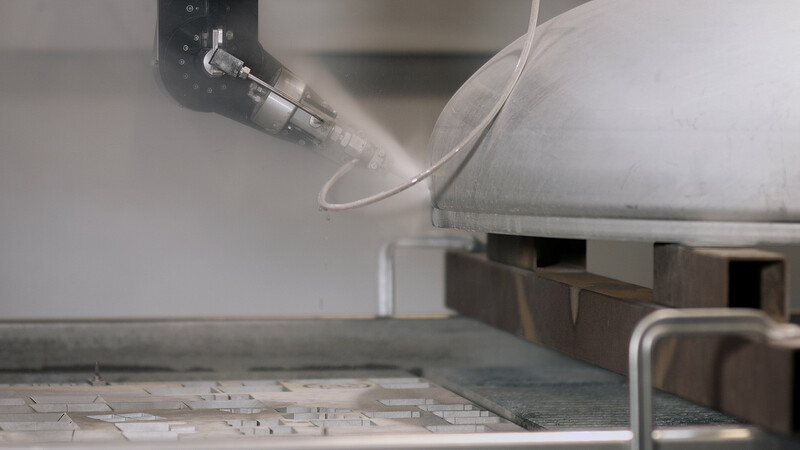 If not interrupted, A waterjet beam could be lethal meters away, therefore all FiveX machines are designed with full size walls and automated front and back protection. 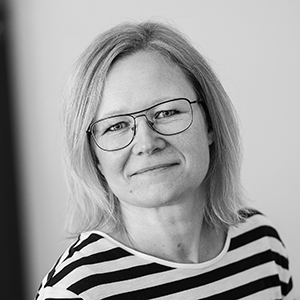 – This time the challenge was to cut cone shaped holes on a vertical surface, says Tony Ryd, Technical Director at Water Jet Sweden. The machine specification has a maximum cutting angle of ± 91° which wouldn’t be enough, so we were forced to redefine machine specification and introduce a new cutting head with ± 0-120° cutting angle. After a thorough evaluation of component suppliers, we finally found a solution that met our long life and high-performance standards, Tony concludes. Even if the FiveX model is a highly complex machine system the PanelOne HMI makes it smooth and easy to operate. PanelOne is a modern HMI with touchscreen buttons and a simple joystick movement which requires just a few days of training to master. – Another unique feature on this specific machine project is a new cost-efficient sensor function, fully integrated in the PanelOne HMI, continues Tony Ryd. 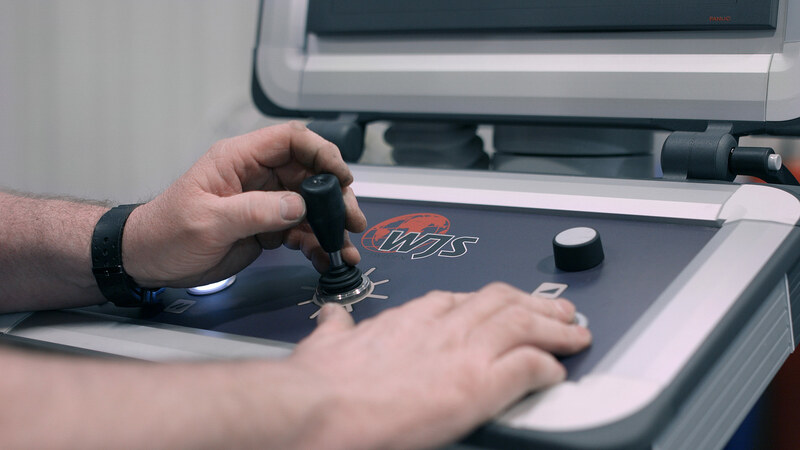 When started, the safety lid opens, it automatically identifies the 3D workpiece placement and sets the zero point. Then, without halting, the program goes directly into cutting mode, Tony tells. 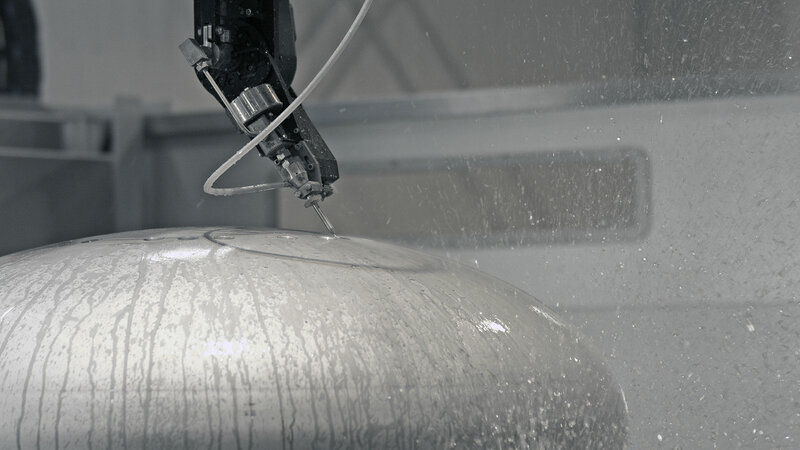 Water Jet Sweden machines are powered by top of the line Ultra High-Pressure Pumps from the leading OEM suppliers in US and Europe, KMT and BFT. They safely deliver consistent ultra-high-pressure water, and the digitally controlled abrasive feeders mounted the machine secure the cutting process. The machine design is extremely stable. Linear drives on the X-beam and ballscrews on Y-axis safely and repeatedly performs high precision free form cutting, with a repetition accuracy of less than ± 0.025 mm. The Water Jet Sweden world patented gantry machine design is unique, since it enables the same cutting accuracy independent of machine table size. A 2-meter machine is as accurate as a 6-meter machine. The FiveX model is designed for both 4100 bar and 6200 bar, which makes it unique compared to similar products in the market. 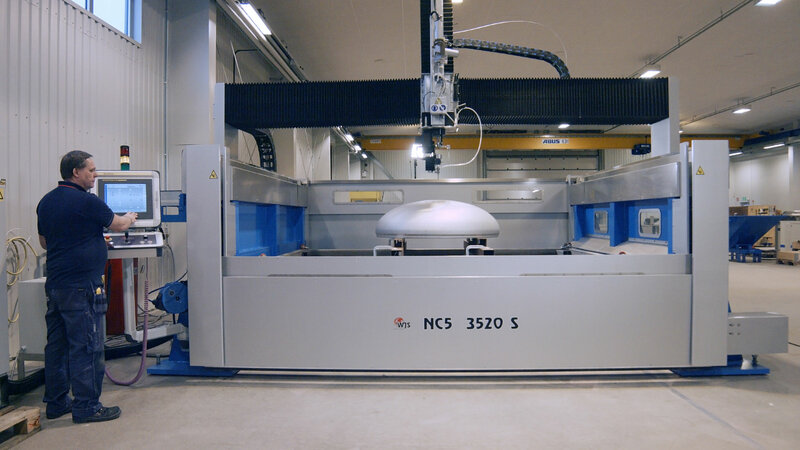 Being famous for long life machine and consistent performance Water Jet Sweden offers a 5-year performance warranty proving the quality of the machine design, parts and components. On this machine model as well as all other. – We guarantee that all our machines keep the same tolerance level after five years as the day when the machine was first delivered, Tony fills in. Another machine is ready for a long life of performance and productivity throughout the world. Built with decades of experience and Scandinavian craftsmanship.